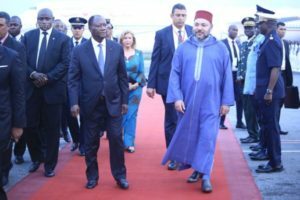 King Mohamed VI of Morocco touched down Sunday in Abidjan for a state visit in the build-up to the European Union-Africa summit to take place in Abidjan late this month. 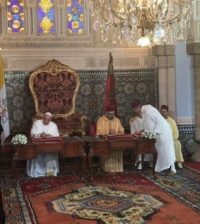 The trip comes on top of several other visits by the monarch in the West African country known as one of the region’s economic powerhouses. The King has kick-started several projects covering several areas including economy. The kingdom and the Ivorian government in 2015 signed an agreement for rehabilitation of Cocody Bay including the construction of four dams and the restoration of four others. The agreement allocated the sum of 425 million euro for the projects which will cover a four-year period. King Mohamed VI was welcomed by President Alassane Drame Ouattara; one of the Moroccan monarch’s staunch allies on the continent. Both leaders will hold a meeting on today Monday at noon at the Ivorian state house. King Mohamed on 29-30 will take part in summit. 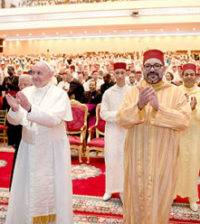 The King who has become undoubtedly an icon figure on the continent since Morocco returned to the African Union; 33 years after withdrawing from Organization of the African Unity. This will be the king’s first ever participation in such an event which will bolster partnership between the African continent and the EU bloc in many areas including security, peace and migration. 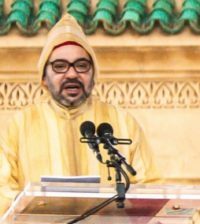 King Mohamed VI will be attending the event despite the presence of the Western Saharawi Arab Democratic Republic (SADR) proclaimed in 1976 by the Front Polisario. 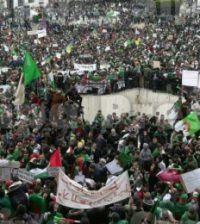 The EU does not recognize the SADR and has backed Morocco’s peaceful autonomy plan.